My Forum • View topic - Dream Team Art Submission Event! Whether you're Panda Picasso or the great Leonardo Di Panda, everyone's got an inner artist and we'd like to invite you to share it! 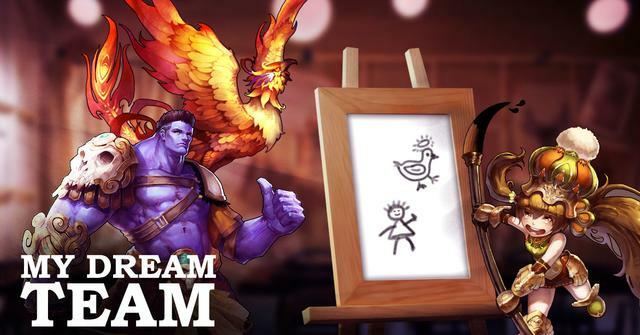 Introducing our new "Dream Team" art submission event! Players are encouraged to let loose their creative energies in the form of an art submission contest. Sketches, computer drawing, painting, whatever! We'd like to see how talented all our lovely pandas are. The theme for this event is "My Dream Team". Take this as you will - capture your favorite heroes in artistic form, or come up with your the Heroes of your dreams! After the completion of the submission period, we'll share all the submissions on our Facebook page. We'll choose our Heroes Favorite to receive a reward, and a Community Favorite will be selected based on Facebook voting. All participants will also receive a Participation Reward. Submissions from May 13th - May 20th. Voting from May 20th - May 24th. Re: Dream Team Art Submission Event!